Watch for this in every Hallmark Christmas Movie. Hallmark Christmas movies have started. You can still get a snack without pressing pause and you won’t miss a major development. Thank goodness. Our favorite plots are all still there, faithful in every detail. Here are some things that happen in every Hallmark Christmas movie. In the big city, twin evils of ambition and technology conspire to rob our leading man or woman of their true selves. A trip to a small town or a farm will be required. Along the way, flights will be delayed. Cars will be stuck in the snow. Wardrobes will need to change. 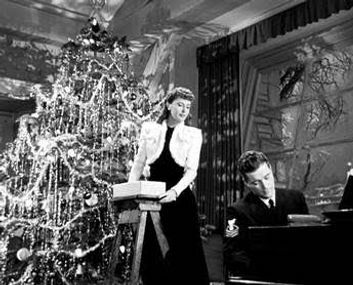 1945 movie, Christmas in Connecticut. Famous entertainer learns to decorate a tree while not wearing flannel. Today’s movies acknowledge that expensive clothes could be ruined in the weather. So we get beautiful and country-fied cold weather wardrobes. Stylish coats and mittens and scarves are crucial to the plot. All this unfolds in a charming cabin or an inn. Oh but there are problems in the country too. The heating at the inn might quit or the owner is days away from eviction. Worse yet, the visitor from the city is actually a scout from some big, cold-hearted company that plans to change things. As these movies move along, cell phones are thrown away, big job offers are turned down, snow storms create white-outs that bring commerce to a halt, forcing our hero or heroine to slow down and learn some Christmas lessons; how to toast marshmallows, trim a tree. There will be baking, and flour may be tossed around in a getting-to-know-you romantic way. Hands will meet over cookie cutters. Everyone is happier wearing plaid. Turns out people in the little town are the kindest, most generous folks anyone’s ever met. Our main character falls in love with the town and also with a former sweetheart who stayed there all this time and is miraculously single. It’s happening again right now. Christmas movies with happy endings. Fine with me. I like my holidays predictable. It’s all about traditions and there’s nothing sweeter than memories of Christmases past sipping cocoa in flannel jammies and giggling at cheesy movies. I say that with all sincere and sweet sentiment. Exactly. Thank you for the reminder about tradition and sentiment – which I also treasure. This blog post has turned into an annual tradition for me and just like Hallmark Christmas Movies, it hasn’t required many updates since it first appeared at this site years ago. Previous Previous post: Revival tents on The Glory Road.